Preheat oven to 400º. Butter both sides of tortillas and sprinkle with sugar. Going clockwise, fold over 1" sections of a tortilla: Use your finger to wet the top of each section with a little water and firmly fold down edge. Continue folding down each edge in an overlapping pattern. Press down folds and place top side down on a sheet tray. Repeat with second tortilla, then use a fork to poke a few holes in each tortilla to prevent bubbling. Cook in oven until golden, 5 to 7 minutes, then gently flip and cook until golden and crispy, 5 minutes more. Remove from oven and let cool. 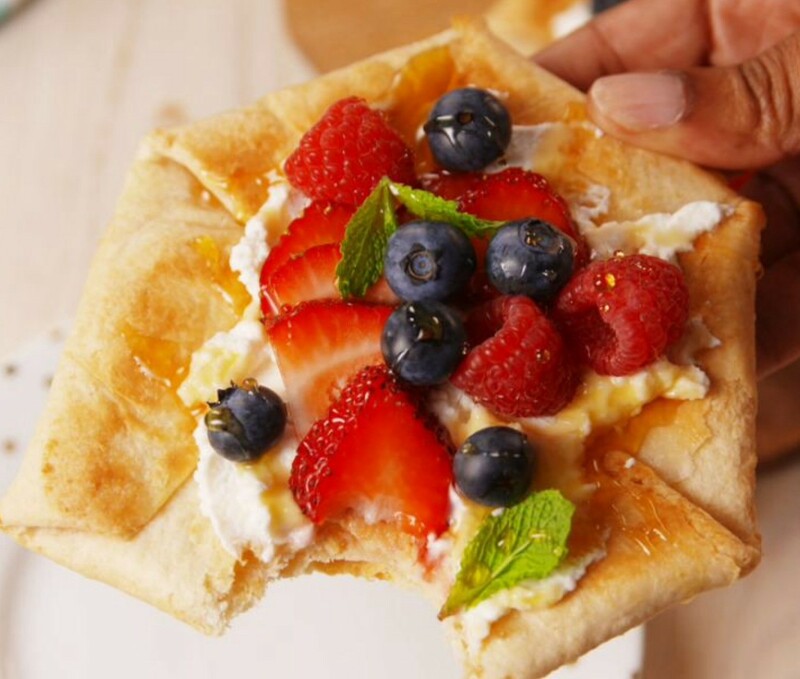 Spread ricotta on folded side of tart and top with berries. Drizzle with honey and garnish with mint.